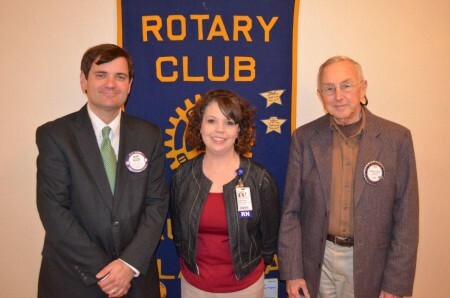 The Auburn Rotary Club welcomed Brooke Bailey, East Alabama Medical Center's infectious control manager, who shared with the club the hospital's efforts to minimize and mitigate the rise of infections that could result during a patient's hospital stay. Pictured with Bailey is program host Bill Walsh (right) and club president David Reaves (left). 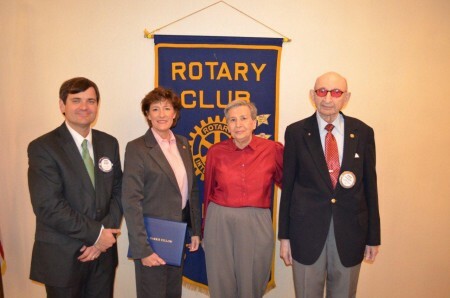 The Auburn Rotary Club's newest Paul Harris Fellow was presented Virginia Thompson (second from left) by Rotarian Dr. Harold Zallen (far right) and his wife Dr. Eugenia Zallen (third from left) for her service to the community through her work through East Alabama Medical Center and as a member of the Auburn University Board of Trustees. A fellowship is bestowed on a Rotarian or someone of the Rotarian's choosing for each single or cumulative $1,000 gift made to the international Rotary Foundation. Such gifts support annual programs, PolioPlus eradication efforts, or Rotary's Humanitarian Grants Program. Also pictured is club president David Reaves (far left).